Behind every missing wizard, behind every village pillaged by goblins, behind every bad happening in Midgård, there may or may not be a villainous mastermind behind it all. Unbeknownst to many, there is a dark underworld in Midgård, home to all sorts of evil personalities and organizations. This new robe pack will give you a spectacular taste of it! 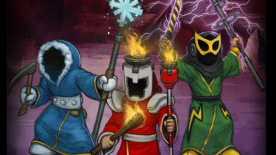 With the Mega Villain Robe Pack players can choose from three more or less sane wizards who all decided that the world has done them wrong and must pay for it! These new wizards all follow the patented Super Standard™ of having their own special themes and matching personalities, this time based on the various Magicka elements. Once a prolific cryomancer in the wizarding community, Coldarr watched in horror as one of his spells went terribly wrong, freezing his beloved. With a heart now turned to ice, he blames the world for giving him the cold shoulder when he most needed a warm embrace. Wizard law enforcement officers are all burnt out on ideas of how to confront the infernal mind of Flamos. He seems to have but one burning desire: to set the world on fire!